Now also posted at PJ Media. Pope Francis made an unscheduled visit to the campus of St. Joseph’s University in Philadelphia, September 27, 2015, to view the sculpture by artist Joshua Koffman commemorating the 50th anniversary of Nostre-Aetate, the Second Vatican Council Declaration on the Relationship of the Church to Non-Christian Religions, in particular Judaism. 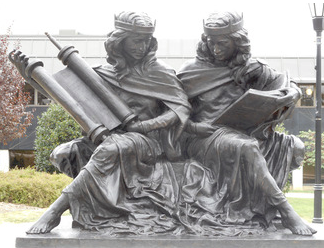 Koffman’s bronze work “Synagoga and Ecclesia in Our Time,” depicts a female figure representing the Church sitting next to another female figure representing the Synagogue, each holding their holy scriptures, which they appear to be discussing. It is meant to oppose centuries of art in which the triumphal Christian “Ecclesia” stood wearing a crown, while a woman representing “Synagoga,” stood blindfolded and drooping, cradling a broken lance in one arm (likely an allusion to the lance that pierced Jesus), while tablets of the Torah appeared to be slipping from her opposite hand . Shamefully prevailing till now, the polar opposite “accepted standard” allows for open promulgation of Jew-hatred from Islam’s canonical texts, by its leading teaching institutions, and most authoritative religious leaders. The virulently Jew-hating, replacement theology themes Vatican II/Nostre Aetate explicitly rejected and sought to expunge from Christianity, are triumphantly preached, now, unchallenged, within their own unique mainstream Islamic framework by the leading institutional and clerical pillars of Sunni and Shiite Islam. Two examples suffice to make this irrefragable point. …presented to reflect all the things that go on within this nation and what comes forth from it, from the Israelites, truthfully reflecting what the prophet [Muhammad] (may Allah honor him and grant him peace) repeatedly reported, namely that this nation will commit exactly what the Israelites committed [before] in completely the same way. They would even take possession of a lizard’s hole [in retaliation] for [that lizard] disturbing them. The chasm between authoritative, mainstream contemporary Muslim and Christian teachings with regard to the Jews, couldn’t be wider. Religious leaders, as well as elites in government policy, academia, and the media must begin to discuss this asymmetry candidly, given the global pandemic of Muslim Jew-hatred. Institutional Islam must be admonished by intellectually honest, gimlet eyed Jews and Christians alike to begin its own “Mecca-Qom-Karbala I” process, akin to Vatican II/ Nostre Aetate.